Notes: Based on the X/1999 manga from CLAMP, available from Viz. The year 1999 has arrived. The world is about to meet its final destruction. Shirou Kamui, a 15-year-old boy, has been chosen to decide the fate of the world. If he joins the Dragons of Heaven and becomes one of the Seven Seals, then the world will be saved. If he joins the Dragons of Earth and becomes one of the Seven Angels, the world will be destroyed and purified. Two Destinies. Two Sides. One Future. X. Sounds like a great premise, right? Don't be fooled by the compelling synopsis. This is not what it is cracked up to be. 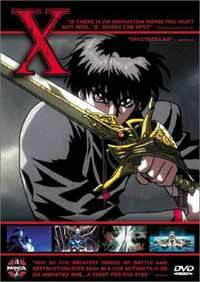 The manga for X was created by CLAMP and is one of the more successful manga to be released in Japan. Knowing that, I expected more out of this movie, but I was let down. Granted, X has some great artwork from CLAMP and animation from Madhouse. X has some great combat scenes. Each fight is well designed. There's some good action here. But the plot and characterization, which are extremely intriguing and well defined, are rushed in this anime. Due to time constraints, Rintarou couldn't focus on the complex side-stories, so he decided to focus on the fate of the world rather than any character background information. Hell, to compensate, they literally tell you all about the characters rather than letting you make any opinions about them. And once you think you can associate with the characters, they die. Some barely even say a word before their last breath! The plot was great in the manga, but it was very muddled here. Everything was rushed to the point where you could barely associate the names of the characters with their faces. Even the actual combat couldn't keep me awake. I fought my urges to fall asleep during the first showing of it, and I unfortunately lost that battle. At the second showing, I was able to stay awake only to be dissatisfied by this movie. It was quite a shame. The movie doesn't do CLAMP any justice at all. Skip the movie and watch the TV series instead. Recommended Audience: X is a rather violent anime. Blood and gore are commonplace throughout the series. Best left to older teens and up. X: The Movie © 1996 Clamp / Kadokawa Shoten o Bandai Visual o Marubeni Corporation o Shelty Co., Ltd. o Sega Enterprises o Victor Entertainment, Inc. o Animation Studio Madhouse Co., Ltd. o Movic Co., Ltd.